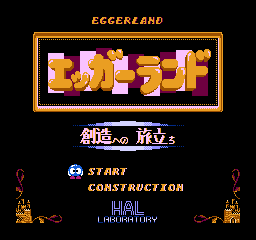 Eggerland: Souzouhe no Tabidachi (エッガーランド 創造への旅立ち, Eggerland: Sōzōhe no Tabidachi?, Eggerland: Departure to Creation) is a puzzle video game developed by HAL Laboratory for the Famicom Disk System. 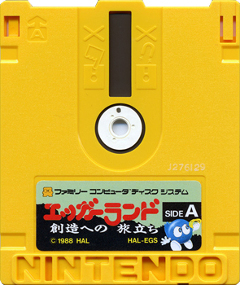 It was released in 1988 in Japan as the fourth game in the Eggerland series, and contains 50 stages. It reuses the core gameplay and presentation of Eggerland: Revival of the Labyrinth. The game progresses linearly (unlike the previous two games), but it brings "Construction Mode" from the original back to the series, after it was abandoned in the previous two installments, which enables the player to create a custom map. The game is shorter than earlier Eggerland titles, and 10 of the puzzles are reproduced from the original Eggerland Mystery, making it among the easiest of the Japanese releases. This game is one of the FDS titles that were available solely from Disk Writer machines, as it doesn't appear to have ever been released at retail. Hal of America (a subsidiary of HAL Laboratory) re-used 47 of the 50 puzzles in this game and included them in Adventures of Lolo (34 rooms) and Adventures of Lolo 2 (13 rooms), two games that were only released in North America and Europe. The three stages that remained exclusive for Japan are the numbers 10, 23, and 43. This page was last edited on 21 December 2017, at 01:23.